For anyone who thinks of the desert as drab and colorless, just detour onto Artist’s Drive and spend a few minutes at Artist’s Palette late in the afternoon. 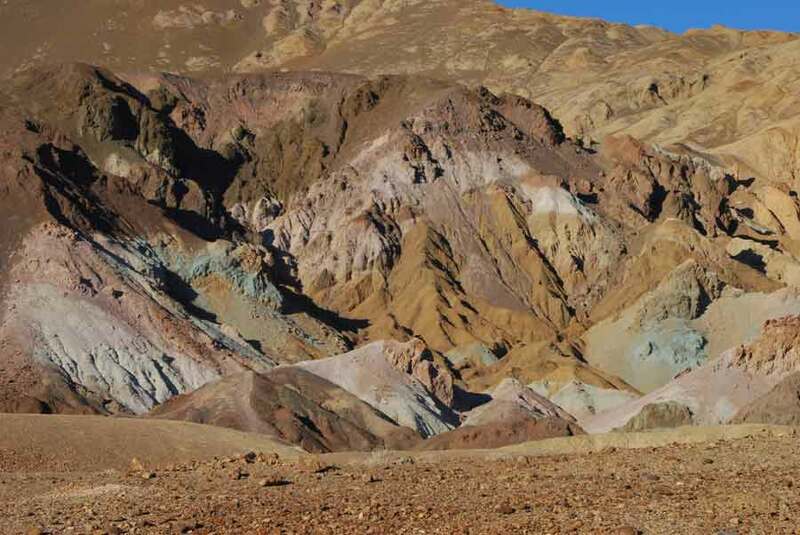 The largest national park outside of Alaska, Death Valley National Park covers 5,262 square miles, making it bigger than Delaware and Rhode Island combined — and almost the size of Connecticut. Its elevation ranges from nearly 300 feet below sea level to over 11,000 feet at Telescope Peak. There are canyons and dunes and even volcanic craters to explore. Now here’s the problem: You may only have a couple of days to see it all during your trip here. 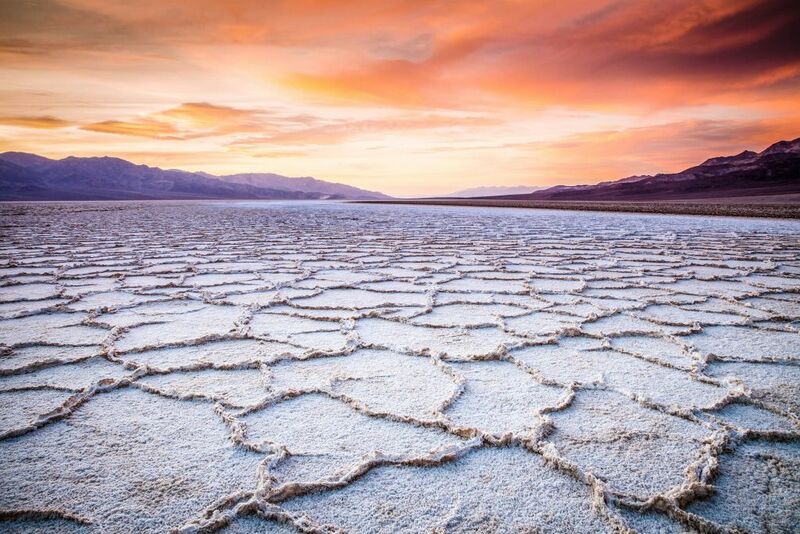 The key in Death Valley is to use your limited time wisely by visiting the bucket list attractions at this bucket list destination. Here’s a look at five of the don’t-miss icons you’ll want to experience at America’s incomparable desert national park. Even if you’re not a morning person, drag yourself out of bed and get out to Zabriskie Point for sunrise. The good news is that this overlook is only a six-minute drive from the recently renovated, historic Inn at Death Valley, which can serve as your base, so you won’t lose much shut-eye. 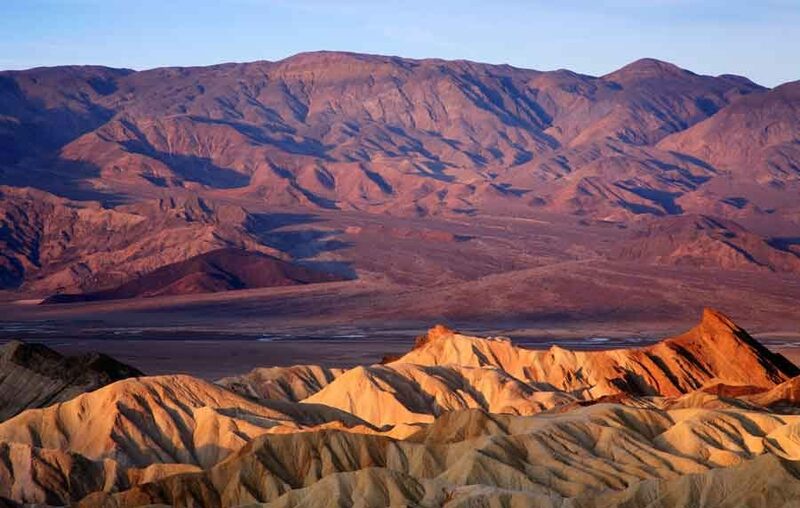 Nor will you have any regrets as the first light of day begins to illuminate the golden badlands below the point, including the prominent triangular spire of Manly Beacon, while the towering Panamint Range across the valley takes on a pinkish-red glow. How low can you go? In Death Valley you can drop all the way to 282 feet below sea level at Badwater Basin, the lowest point in North America. About 20 minutes south of the inn along Badwater Road, the basin is a 200-square-mile area of salt flats on the valley floor that you can reach from the parking lot via an easy boardwalk trail. Most of the time there’s only a small amount of water here, making it possible to walk out on the salt flats. But in 2005, so much rain fell that a lake formed at Badwater and visitors were actually able to kayak on the floor of Death Valley. Back at the parking lot after the mile-long round-trip walk, look for a small sign high on the cliffs across the road. That sign indicates just how far up you would have to climb just to reach sea level. If geology is typically a science of silence, that certainly wasn’t the case one day 2,100 years ago when Ubehebe Crater formed. As magma from deep within the Earth came into contact with deposits of groundwater, a massive volcanic steam eruption resulted. After that first big blast, a series of smaller eruptions ensued, covering an area within 15 miles of Ubehebe with debris. Except for the often-gusty winds, Ubehebe Crater is quiet these days. From the overlook, you can gaze down into the 600-foot-deep crater (which was originally 800 feet deep before rock and gravel partially refilled it). 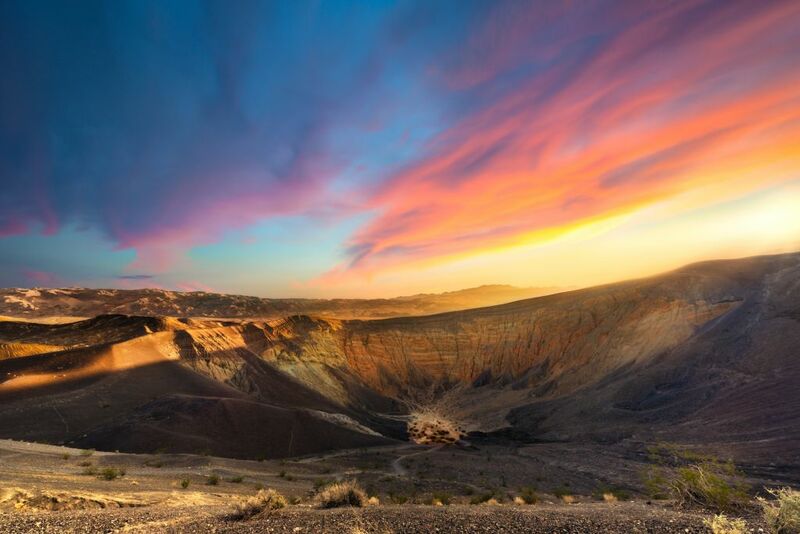 The crater is a half-mile across and to best appreciate its scale, follow the 1 ½-mile trail along the rim, where the views extend out over the surrounding volcanic field. As its name suggests, Artist’s Palette is like a painting. The green and turquoise hues, as well as the violets and reds, almost don’t look real, appearing to be painted onto the tawny face of the Black Mountains. Give yourself time to watch as the colors deepen, then fade with the changing light. And don’t be shy about coming back on another day: Artist’s Palette is always different. This is the tricky one. Death Valley’s unforgettable ephemeral wildflower displays are dependent on the amount, timing, and intensity of the rains that occasionally reach the California desert, as well as the right sun and wind conditions. In some winters and springs, the wildflowers remain largely dormant. But in the years of so-called super blooms, like those in 2005 and 2016, Death Valley comes alive with an unimaginable beauty. Desert golds blanket huge expanses of the park, while bear poppies add their vivid oranges and western mariposa lilies sprinkle areas with violet. 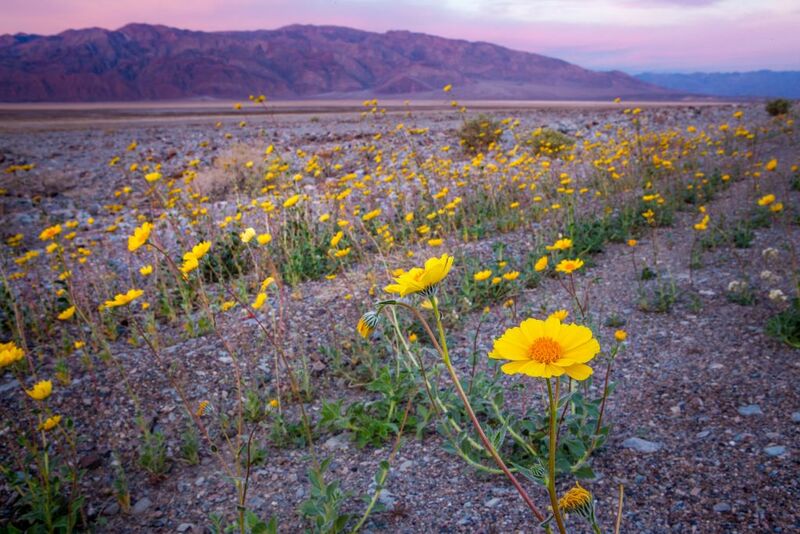 When conditions are right, Death Valley blooms from mid-February into April with displays climbing into higher elevation as the spring progresses. Updates are available by contacting national park headquarters or checking online at the Theodore Payne Foundation’s wildflower hotline.